A relaxed western much more about characters than action, Rooster Cogburn was John Wayne's penultimate film. The teaming with Katharine Hepburn places the spotlight on two legends enjoying a late career adventure on horseback, and nothing else about the film really matters. After killing a clutch of bandits, eye-patched Marshall Rooster Cogburn (Wayne), first introduced in True Grit (1969), is himself in trouble with the law for being too violent too often. He is stripped of his Marshall's star and instructed by a judge to ease off into retirement. But Cogburn's manhunting skills are soon back in demand: he is reinstated and instructed to track down and apprehend a criminal named Hawk (Richard Jordan). A major robbery is being planned, and Hawk and his men, including expert scout Breed (Anthony Zerbe) have violently stolen a wagon full of nitroglycerin to be used in the heist. Cogburn follows Hawk's trail to a small native settlement, where Hawk has just killed the elderly Reverend George Goodnight. Seeking revenge, the Reverend's deeply religious, highly resourceful, and extremely stubborn daughter Eula (Hepburn) insists on joining forces with Cogburn to hunt down Hawk and secure the explosives. On their quest Rooster and Eula will need to survive several dangerous encounters with Hawk and his men, including a raft ride down a winding river, but more importantly, they will also have to learn to tolerate each other. In a film in which not much really happens and the few events that do transpire either borrow heavily from The African Queen (1951) or else strain all credibility, it's left to Wayne and Hepburn to create a watchable experience, and they do not disappoint. Both having started their careers in the late 1920s and both now 68 years old, Wayne and Hepburn ease into the leading roles with polished expertise, and in their first screen pairing they make the film worthwhile. The verbal sparring between Rooster and Eula is plentiful and delivered with a laid back comfort consistent with characters who can now see most of life's battle in the rear view mirror. Eula is of course trying to tame and civilize Rooster into a man more suitable for an evolving west, but both of them know that it does not much matter whether he adapts or not. Rooster is a man of his time, and other than the need to catch the few remaining Hawks, Rooster's time is passing and soon so will he. The supporting cast try hard but at times seem to be in an entirely different movie. Richard Jordan and Anthony Zerbe do their best with under-written and poorly defined roles, Jordan as Hawk hissing with amplified evil at every opportunity and Zerbe as the more mysterious Breed struggling to define a backstory that never materializes. Strother Martin gets one scene to stumble in and just as quickly stumble out of the film. 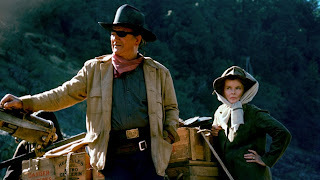 Rooster Cogburn was directed by Stuart Miller, and he complements his two stars with gorgeous Oregon scenery. There are frequent mountains vistas that speak to the enormity of the still not fully conquered west, and the lush green of the rainforest gives the movie a rich, deep visual setting. Otherwise, Millar is rather pedestrian in constructing the film, the few action scenes clumsy at best and delivered with no flair. Which is all to emphasize that Rooster Cogburn is a case of two phenomenal giants of the film world joining forces and shining brightly enough to render all else close to irrelevant.